The 2012+ F30 335i has 5 factory brake options: standard brakes, an M Sport trim package, two different M Sport upgrade options, and an M Performance accessory retrofit. Early in the car's life it became obvious that brake parts were going to be confusing for owners, mechanics, and even parts experts. BMW further confused things by offering different options in the USA versus Canada and Europe. Canada, which usually has the same specs as USA, had a slightly different package for a couple of years. The BMW parts diagrams, ETK, offered a few clues but it took additional research on forums, galleries, and even buying the individual components to confirm their differences and interchangability. Forums and even RealOEM, which is based on the ETK, had a lot of unintentional misinformation. In over twenty years of BMW parts work I haven't seen a more confusing brake application. BMW even used the same name for two different packages - M Sport, which was a $3,000 trim package and a separate $350-$650 brake upgrade. This page currently only applies to the 335i models - the 435i came out two years later and is much simpler. I also have a separate page for the 320i/328i, which may actually be more confusing, that you can find here. The M235i is the easiest as it only had one factory brake specification. Note that none of this info applies to the E82/E9X brakes. What Color Are Your Brakes? As strange as it sounds we can greatly narrow down which brakes you have by the color of your front and rear calipers. The color of the calipers provides the most clues as to what you have. All F30 335i models came with a 4-piston Brembo caliper as standard on the front. So saying your car has "Brembo brakes" does not narrow it done enough, unfortunately. It's very helpful if you have your original build sheet or window sticker. You can get this from your dealer or from BMW NA if you don't have it. So a quick visual check will tell you most of what you need to know. My Car has Grey Calipers. Grey (unfinished) calipers are the stock part used around the world. 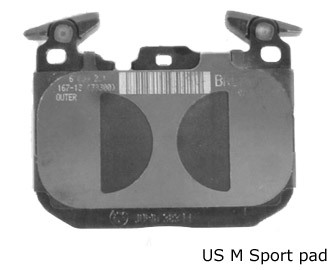 However in the US, grey calipers were used for the stock brakes and one of the M Sport Brakes options (see below). Following the logic in the ETK, there are multiple M Sport brakes for US cars. Even though the option code remained the same (S2NHA) there are two different sets of part numbers related to that code - a 340mm rotor and a 370mm rotor. You definitely want to be clear on which brakes you have because rotors and calipers of different sizes are not interchangeable. One dead giveaway is the rear caliper - a single piston caliper is for the stock 335i brake sizes; a 2-piston Brembo caliper was only used with the larger brakes. US M Sport trim package (option code P337A): The M Sport is one of the trim packages offered when the car is ordered (base, Luxury, Modern, Sport, or M Sport). It was around $3,000 and got you 18" wheels, M steering wheel, M Sport aerodynamic kit, Sport instrument cluster, and glossy Shadowline black exterior trim. The brakes are mostly the same as the other trim lines except for the front pads. The front pads were actually the same as used on the M Performance accessory kit. Many drivers complain that they lack feel and initial bite. Luckily all of the F30 335i calipers share the same pad shape so pads can be interchanged. 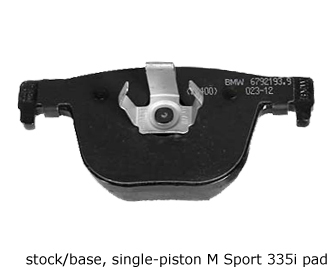 US M Sport Brake Upgrade 1 (S2NHA) (pads only): In the BMW parts database are pads listed as "M Sport S2NHA" that fit the stock 4 piston front calipers and the single-piston rear calipers. 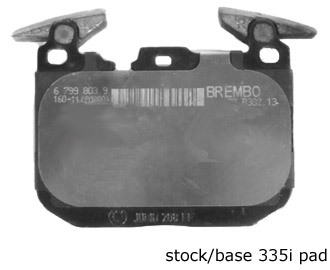 These also happen to be the stock brake pads used in Europe. This was a $350-400 option on 2012-2013 cars and could be added to ANY trim package (even a base model). The Euro pads have much more bite and dust a lot more than the stock pads. The bite makes the brakes feel stronger but the dust can be excessive for some people. The rotors are blank - no drilling, dimpling, or slotting and are the same size as the standard 335i brakes. M Sport Brake Upgrade 2 (option code S2NH or S2NHA) (pads, calipers, rotors): Sometime during 2012-2013 production, BMW changed the M Sport Brake option to include larger 370mm front and 345mm rear rotors, a different front caliper (still a 4-piston Brembo), and 2-piston Brembo rear calipers. It was a $650 option but retained the "M Sport S2NHA" name and option code. It could be added to ANY trim package (even a base model). This kit was the same as the M Sport offered in Canada/Europe. The calipers should be blue with an ///M logo but there's a slim chance they could be grey/unfinished with no logo (I know at least one owner on a forum with this setup). The front pads were a similar aggressive Euro-spec pad as above. The rotors are blank but the dimpled/slotted rotors from the M Performance brake kits are a direct fit if you want to change their appearance. My Car has Blue Calipers. Congratulations! Your car is easy to decode! 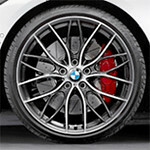 M Sport Brake Upgrade 2 (option codes S2NH or S2NHA) (pads, calipers, rotors): In Canada and Europe, the M Sport brake option (option code 2NH) came with blue Brembo calipers in the front and rear and larger rotors. This kit has the same specs as the M Performance accessory kit but with the blank rotor design and blue calipers instead of red, orange, or yellow. Officially the US did not get the blue calipers in our M Sport upgrade until the 2014 model year. All 2014 models (including 435i/440i models) with the S2NHA M Sport Brakes used the same components as the rest of the world. 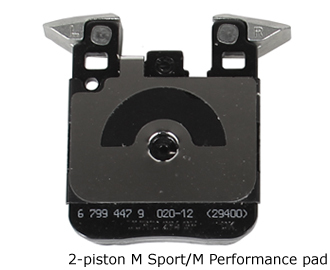 Since the M Sport shares the same specs as the M Performance, the parts are interchangeable. 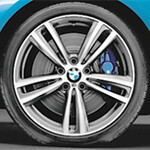 You can add M Performance dimpled/slotted rotors to the blue M Sport car and they will be a direct fit. They are also a little lighter than the standard blank design. Pads are also interchangeable among the calipers. The M Sport pads are more aggressive and give more bite and feel than the M Performance pads. My Car has Red, Yellow/Gold, or Orange Calipers. M Performance Brakes (pads, calipers, rotors): This is the M Performance accessory brake upgrade. It was offered through the BMW dealer as an accessory retrofit and would have been installed by the BMW dealer or purchased from another parts supplier. From 2014-on they could have been installed at the port of entry. The calipers were red, orange, or yellow-gold but they were the same Brembo calipers offered on the blue M Sport Upgrade above. The rotors were also the same sizes as the later M Sport kit and had a dimple/slot design on them. They were also a 2-piece design with an aluminum hat that saved a little bit of weight. 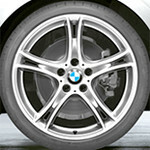 The M Performance brakes sold for a large premium over the stock or M Sport brakes ($2,000 or more plus installation). Yet the rotor sizes are the same as on the M Sport. You did get a sporty looking rotor though. If you have the M Sport brakes you can add the M Performance rotors without modification. 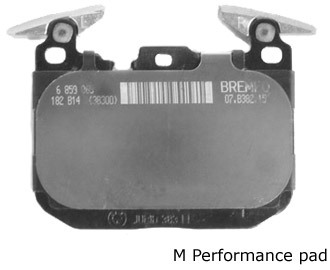 If you're unhappy with the feel and performance of the M Performance brakes, try using the pads from the M Sport package (see below). US stock/base 34106859067 performs with low bite and low brake dust levels, great for people who don't want to have to think about their brakes. (34116859282) lots of initial bite but also lots of dust; performance drivers will like this pad a lot but daily drivers will probably dislike the amount of dust from them; if you were unhappy with the brake feel in your stock setup you can swap the M Sport pads in for an immediate improvement. M Performance Kit 34116859066 low dust and low feel; a lot of M Performance customers have been put off by the pads that came with this kit - they're dull feeling and totally out of character with what they expected. In this case the M Sport Euro pads above have more bite and feel. Race pads race pads are super aggressive and produce more braking torque than what a typical street pad is designed to create. They are also engineered to withstand the heat in a racing environment. Special materials are used to ensure the pads won't fade or come apart at the extreme temperatures found on a racetrack (over 1,000 degrees F). Race pads like the Pagid Yellow shown below will give phenomenal braking performance but because of the specialized materials they should be avoided for street use. 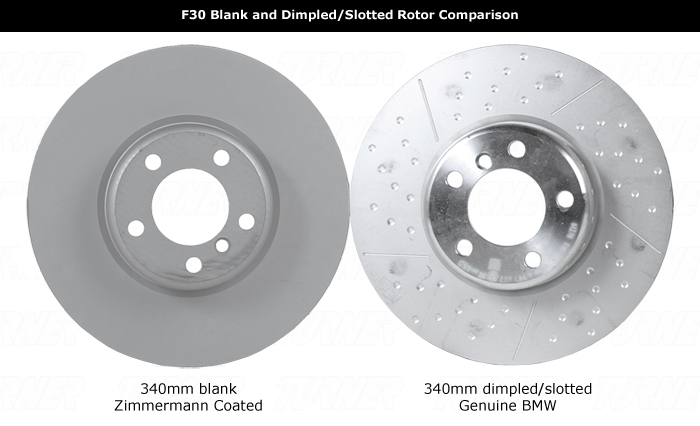 How did BMW use the same pad for a larger brake rotor? Yes, the overall rotor diameter is larger on the M Sport and M Performance packages. But look closely and you'll see the swept area of the rotor (the section that the pad actually touches) is the same. The 30mm of additional size comes from expanding the center hub. There is more material on the brake rotor hat which gives it the additional diameter. The M235i/M240i, F87 M2, and F80 M3/F82 M4 use the same pad shape as the M Sport/M Performance brakes. (single-piston caliper) 34216850570 lots of initial bite but also lots of dust; performance drivers will like this pad a lot but daily drivers will probably dislike the amount of dust from them; if you were unhappy with the brake feel in your stock setup or the M Performance brakes you can swap the M Sport pads in for an immediate improvement. (2-piston caliper) 34216855474 low dust and low feel; a lot of M Performance customers have been put off by the pads that came with this kit - they're dull feeling and totally out of character with what they expected. You can get a lot more bite and feel by changing the front pads but no other option exists for the rear pads. (2-piston rear caliper) race pads are super aggressive and produce more braking torque than what a typical street pad is designed to create. They are also engineered to withstand the heat in a racing environment. Special materials are used to ensure the pads won't fade or come apart at the extreme temperatures found on a racetrack (over 1,000 degrees F). 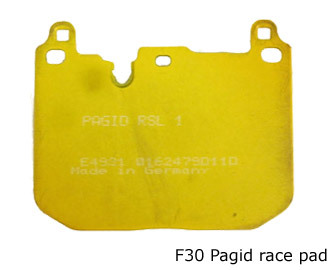 Race pads like the Pagid Yellow shown below will give phenomenal braking performance but because of the specialized materials they should be avoided for street use. For the 335i there are just two front rotor sizes - 340 or 370mm. 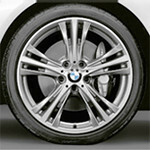 The 340mm is the standard M235i/335i/435i disc size and also used in the US M Sport upgrade option for 2012-2013. The 328i/428i also used this rotor in its own S2NHA M Sport brake upgrade and was offered with a dimpled/slotted face. This can be used on the M235i/335i/435i stock brakes for an appearance upgrade. The 370mm rotor was used on the M Performance accessory kit and in the later M Sport upgrade option. All M Sport brakes (US or Canada/Euro) used a blank rotor design - no slotting, drilling, or dimpling. The M Performance slotted/dimpled rotors are a direct replacement for the 370mm M Sport brakes. Below is a table listing the option codes and trim package codes relevant to the F30 brakes. "A" might stand for America, indicating a different spec than the rest of the world. Information is inconsistent on how the S2NHA can be ordered. It doesn't appear in either the 2012 or 2013 official ordering guides but does show up in BMW ETK, Real OEM, and owner's forums. In the official 2014 ordering guide S2NHA requires 2PE and 0ZMM/P337A. In the 2015 ordering guide, they relaxed the requirements to only bigger wheels with performance tires and top speed increased. So in theory, you could have a base model 335i with no other options except for the upgraded brakes, wheels/tires, and increased top speed.